French Toast is my second recipe from my old home economics book. I recently found my old cookbook and have often wanted to cook my way through the book. So I am making a video series and a blog series where I will be cooking all the way through the cookbook. French toast is a great way to use up day old bread. In fact, some bread makes better French toast than others. If you have some old cinnamon raisin bread, Challah, or perhaps even some Texas Toast , you are in business to make French Toast. Essentially old bread (old does not mean moldy, don’t eat moldy bread), is dipped into an egg batter and the bread is cooked with butter in a skillet or in a pan. This batter turns into a lovely concoction of eggy bread that you can serve with almost anything. You can serve French Toast with butter, syrup, powdered sugar, or even fruit. I have even had this done Russian style and it was served with smoked fish and white fish spreads. Making up a batch of French Toast is a great way to use up bread that is just past its prime, it is economical and best of all it is a very easy recipe to make. What should you serve with French Toast? Are you looking for dishes to serve with this breakfast? Since this is such a starchy food, I suggest that you go for something that is high in protein. Here are some ideas for you. Eggs – poached, scrambled, fried, etc. What toppings are good for French Toast? You can serve all sorts of toppings with this breakfast dish. You are ready only limited by your imagination. Here are some of my favorites. You can go sweet or savory. Looking for more great breakfast recipes? Be sure to try some of these. Combine beaten egg, milk, sugar, and salt in a shallow pan or bowl. Melt butter in warmed skillet, make sure the bottom is covered with melted butter. Dip slices of bread into egg mixture. Don't soak, simply dip and remove. Place in a preheated skillet or on the griddle. Saute until brown on one side. This should only take a minute or two. Turn and saute the other side. Serve immediately. I know this is technically for breakfast but it was great at 12 am when I was hungry and had almost nothing in the fridge except bread, eggs, and milk. Thanks for the recipe!! I’ll definitely be saving it for later. Could I possibly get the measurements please! Omg.. i made french toast and it was amazing! Thank u! I like to use day old challah or brioche for mine. I soak the slices until the eggy milk goes right through to the core of them before sauteing them in unsalted butter infused with vanilla. Sometimes I bake them instead, the perfume that fills my kitchen is well worth the wait. These two different types of bread make the best French toast ;). I don’t know which one I like more. That’s my favorite way to make it, I like mine baked better than fried, I just drizzle the top of it with the infused butter before baking. 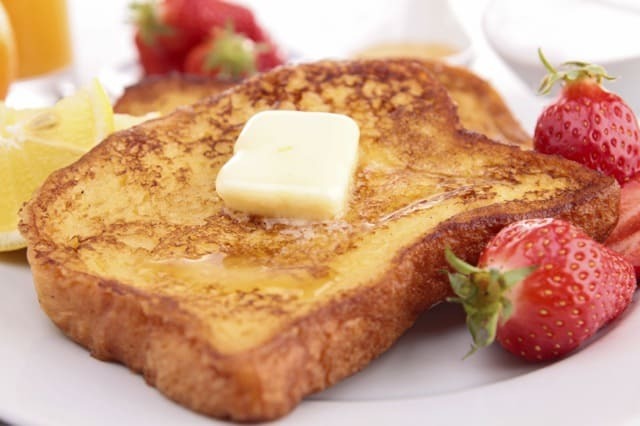 Do you have favorite additions you like to add to your French Toast?